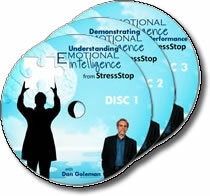 Order the complete Emotional Intelligence DVD Series and save! Daniel Goleman pioneered the study of Emotional Intelligence in 1995. Now, in this DVD training series, you can discover the power of developing Emotional Intelligence in your own life. People who are Emotionally Intelligent tend to be better leaders, are more productive, earn more money, communicate better, handle change better, work well as a team, and handle stress better than those who lack these skills. This complete series facilitator kit includes 3 DVD videos, 3 PowerPoint presentations, leader’s guides, and bonus materials. Wow, this program hits the nail on the head! I used to drive a van full of children (8 or 9 kids) from daycare back to the homeless shelter every day. Every day some two kids would get into an argument and for 30 minutes, sitting in traffic and playing referee was pretty rough. One day there were only 3 kids, a brother and sister who got along like gold and another boy. When the little boy started whispering and suddenly the most get-along pair I ever met were at each other’s throats, I started to figure out where the trouble was coming from. I had a long talk with the culprit (who was never involved in any of these fights in any way, to all appearances) and we stopped having conflicts on the van ride. THAT is an 8-year-old child with astounding emotional intelligence!